This study has been undertaken and this report has been prepared in order to develop parametric data for use in analyzing the event of April 19, 1995 in which the Alfred P. Murrah Federal Building was destroyed by a terrorist attack utilizing explosive compounds. Due to a limited amount of information in the public domain regarding blast effects against structures, a study was undertaken in which photographic data combined with known test parameters was analyzed to provide baseline data for estimating the effectiveness of explosive devices against reinforced concrete structures. The maximum potential blast pressure is used as the determinate factor in establishing resistance to blast and overall blast effect. A study was conducted to map the pressure regions on a vertical face wall of a reinforced concrete test structure to provide baseline data. Data for the study was obtained from General Benton K. Partin, USAF (Ret). This information was supplied to him at his request by the Armament Directorate, Wright Laboratory, Eglin Air Force Base, Florida. A copy of this memorandum can be found in Appendix B.
Utilizing data from this study various conclusions can be drawn about the nature and components of the event of April 19, 1995 at the Murrah Federal Building. This report is limited in scope to providing basic data and furnishing certain limited conclusions about the events in Oklahoma City and is being produced as part of a larger more detailed study of the events which occurred there. This test structure constructed at Eglin Air Force Base while not as large as the Alfred P. Murrah Federal Building in Oklahoma City has many similarities and therefore provides an excellent source for data. The Eglin Test Structure (ETS) was constructed of reinforced concrete and had a footprint of 80 feet in length and 40 feet in width. The ETS was comprised of three stories with a total height of 30 feet. The ETS is similar to Murrah in its basic layout with three rows of columns in the long axis and a series of narrow bays in the shorter axis. The ETS was constructed of six inch thick concrete panels similar to the six inch thick floor panels of Murrah. In addition a series of 14 inch square columns supported the panels in the corners of each room and at the edge of the floor panels. This configuration bears a similarity to the Murrah building system of columns, T-beams and floor panels. This ETS does not appear to the have the extensive series of piers that the Murrah Building had for its' foundation. The ETS appears to be built on a spread footing which would be consistent with the design in the area of Eglin Air Force Base. The walls and columns are monolithically poured one story at a time. On top of the column the next floor and edge beam combination is formed then poured and then the next story is formed and poured on top of this. The building appears to have several cold joints in the walls thereby producing a structure that has diminished strength. The normal concrete strength utilized in this type of construction and in this area of the country is 3,000 psi. 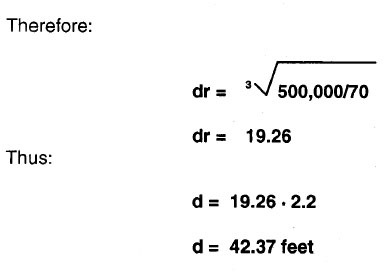 The Murrah building was constructed with 4,000 psi concrete and it would be reasonable to expect that the Murrah building concrete would have tested in the area of 4,500 psi or above on April 19, 1995. Steel reinforcement for the ETS is provided by a single layer of #4 (1/2") rebar placed 18 inches on center in the wall and floor panels and the columns which are 14 inches square appear to have two #4 rebar vertical reinforcing bars. 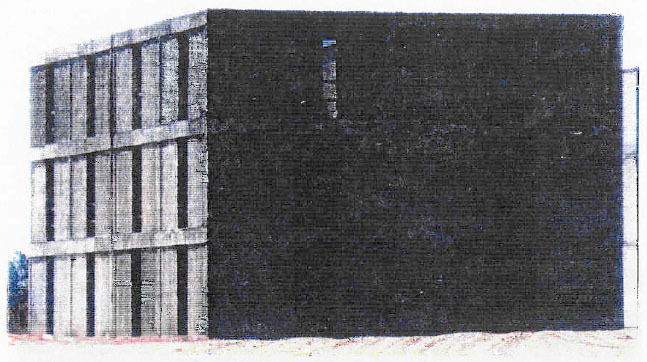 The reinforcement in the Murrah Federal building by contrast was much greater, with approximately five times the amount of steel in a typical floor panel. Typical reinforced would call for two layers of #5 rebar with a spacing of nine inches. The ETS while similar to Murrah must be considered an inferior structure in terms of strength and blast resistance, however direct application of the data will be used to estimate probable damage to the Murrah Federal Building even though the Murrah Federal Building should be expected to provide significantly more blast resistance than the ETS. The ETS while having a slab on grade and a second floor 10 feet above the first and the third 10 feet above the second was not constructed with a roof panel as can be seen in the photo of the structure. This lack of roof panel it should be noted reduces the overall rigidity of the structure and in particular the third story wall panels making the third story more susceptible to damage from an explosive device. While no age for the ETS is given, it is known that this is a purpose built test structure and all indicators are that the testing was conducted soon after the structure was completed thereby ruling out additional strength development by the concrete as a function of time. This process is normal to concrete as the strength ratings for concrete are for 28 day cures. Concrete while attaining the specified strength in 28 days will continue to increase in strength over time as a natural process. In general it can be noted that the ETS exhibits some minor flaws in construction but it can be generally assumed to have been constructed correctly due to the general appearance as shown in the photos. The reinforcement however is not up to industry standards as a general rule for structural purposes. This structure is actually more indicative of some structures to be found in third world countries and is not representative of concrete structures to be found in the United States. The United States Air Force conducted a series of live fire tests on the ETS in order to demonstrate-determine the efficacy of various weapon systems components and explosives. Three different explosive tests were conducted on the ETS. The first test used 704 lbs. of Tritonal which is equivalent to 830 lbs. of TNT or roughly 2,200 lbs. of properly prepared Ammonium Nitrate and Fuel Oil mixture. Because this test most closely parallels the Truck bomb at the Murrah Building this test will be of particular interest to this report. The device was placed 25 feet from the vertical surface of the 40 foot side wall of the ETS. It was encased in a light aluminum case thereby closely duplicating the lightweight enclosure of the device used on the Murrah Federal Building. This is important because the Murrah device was composed of ammonium nitrate - fuel oil contained in blue plastic drums in the back of the Ryder truck, which either was constructed of aluminum skin or of plastic laminate on the cargo body itself. This is in contrast to the other devices in the testing which had heavy casings around the explosive. The heavy casings while providing shrapnel which then causes damage, consume a lot of the energy of the explosive in order to break up the casing itself. This energy consumption is manifested in a reduced peak blast pressure in the shock wave which emanates from the explosion. It is a tradeoff in which a denser mass (bomb casing) is accelerated and causes damage by colliding with the target. This effect will be described in looking at test two and three. The second test used a standard Mk-82 warhead placed inside the structure on the first floor approximately four feet from the exterior wall. The Mk-82 is a heavy cased weapon designed to hit its' target and provide damage from the case fragmenting and becoming shrapnel when the explosive is detonated as well the damage provided from the resultant shock wave which follows the shrapnel. the casing provides close in mechanical coupling of the blast energy which is always preferable to attempting to destroy a target with an air coupled blast wave. Figure three provided by Wright Laboratory shows a large area of catastrophic structural failure resultant from the target being damaged by first the shrapnel and then in a weakened condition the blast wave which follows. This is a good example of what direct mechanical coupling of explosive energy can produce in terms of damage when contrasted with damage produced from air coupled blast waves alone. Analysis of the photograph (figure 3) of the post-test structure shows nearly complete destruction of the wall panel and column from the first floor. This is due to damage caused by the shrapnel effect of the bomb casing striking the structure at high velocities and causing the concrete to shatter from the impact. 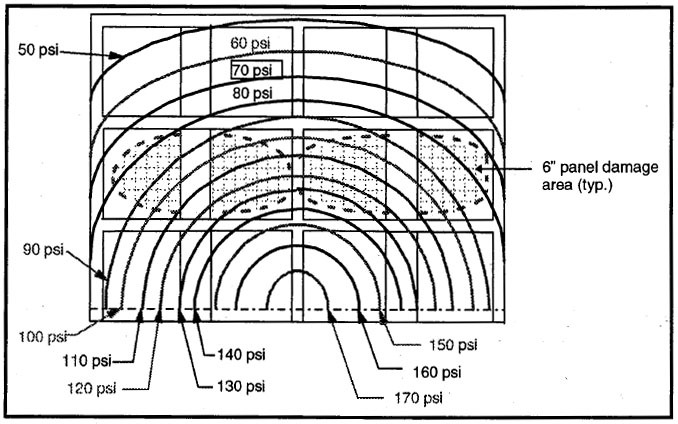 Blast wave effect upon the column would be negligible while the overpressure generated from the explosion of the device placed internally would exceed the limits of the six inch panel. However due to the light reinforcement, peripheral damage caused by loads induced from the panel deflections would be highly improbable due to insufficient reinforcing steel to carry the loads before complete break-up of the panel. While the second floor panel had direct pressure damage, the third floor panel is indicative of gravity induced failure caused by the damage to the wall panel, column, and second floor panel from the Mk-82 warhead on the first floor. The third test involved a 250 lb. class penetrating type warhead with an explosive charge equivalent to 35 lbs. of TNT. Once again as can be seen in the image in Figure three as supplied by Wright Laboratory, the damage caused by even a small amount of explosive when mechanically coupled to the target can be considerable. In this case the Mk-82 device was placed on the second floor in an outside corner approximately 2.5 feet from the walls. As in the case of the Mk-82 warhead, considerable damage is actually produced by the shrapnel effect of the casing of the device itself. It should also be noted that the second test involving the Mk-82 warhead was conducted adjacent to this area. The second test occurred to the right of the third test area as shown in the photograph. Two things should be noted from the photo. The first item is that the area was cleaned and the remaining second and third floor panels were removed prior to the third test. A visual reference can be seen in the ladder from the Figure four photograph, this ladder can be seen just to the left of the damaged area in figure three. The generally smooth appearance of the third floor support beam in Figure four indicates that the structure was constructed with cold joints in certain areas and is not truly monolithic in terms of floor construction. This condition reduces the stiffness of the structure as well as its total strength. The second item is some of the damage shown in Figure four, particularly in the case of the first floor panel must be attributed to the second test and not the third. This damage also provides the third test with a locally weakened structure so as to effectively produce somewhat more damage than would be effected by the same explosive device on an undamaged structure. Figure four also provides an excellent example of erosion damage caused by the bomb casing. 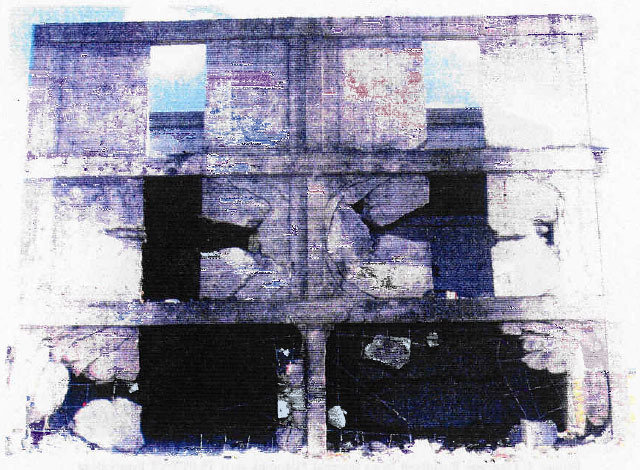 The second floor column in the blast area shows a definite pattern of damage caused by the bomb case fragments impacting and shattering the concrete. This is manifested by the irregular pattern on the edges as can be seen in the photograph. Also bare rebar can be seen in the third floor bean just to the left of the column where this type of damage has occurred. This shows the pattern of damage in which concrete is damaged by debris and then carried away in the trailing shock wave. 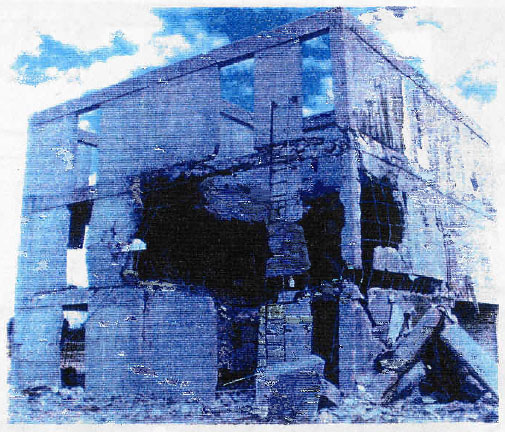 This photograph also reveals the inherent toughness of concrete, in that much of the structure is remaining even after significant damage caused by the third test. It should be noted that both the Mk-82 and the 250 lb. penetrator are designed for gravity drop from aircraft and not for static deployment as was the case in these series of tests on the ETS. The first test is of particular interest because of the similarities to the Murrah Building device and conditions, however tests two and three are of interest because they show the inherent resistance of monolithically constructed reinforced concrete structures and the characteristics of damage caused by mechanical coupling of the explosive forces to the target. Detailed analysis of the first blast effect test was undertaken in order to provide a baseline for predictive yield points of reinforced concrete in explosive conditions. The method devised was to compile a matrix of the maximum potential blast pressure for the face of the structure as calculated from the maximum possible yield of the aluminum cased device based upon the information supplied by the Armament Directorate at Wright Laboratory, Eglin Air Force Base, Florida. A pressure map matrix was prepared for the vertical face of the structure by mapping the structure in a one foot grid with allowance for the 1.22 foot radius of the explosive material. This pressure map matrix was then transferred to the stations laid out on an elevation of the north face. The maximum potential blast pressures at various damage areas could thus be noted in this manner. The entire pressure map matrix is found in Appendix A of this study. In this equation the explosive material is assumed to be in spherical form. Straight line distances for the matrix were calculated with standard trigonometric right triangle equations with the center of the explosive device placed at 25 feet from the vertical face per the data given by the Armament Directorate, and 1.2 feet from the horizontal plane which is assumed to be the ground. Maximum dynamic pressure or maximum potential blast pressure occurred at a point 20 feet from the corner of the building in the center of the face and 1.2 feet in altitude from the ground, the maximum pressure at this point is calculated at 174.3 psi. It should be noted that these are maximum potential blast pressures and actual pressures can be affected by the final configuration of the explosive, chemical efficiency of the explosive charge ambient conditions such as temperature and pressure at the site. Also the actual pressure experienced by the test structure in the case of the first test could be higher due to reflectance caused by the placement of the explosive directly on the ground. This is in contrast to the Murrah truck bomb where the center of the device was some six feet above the street thereby allowing a four foot air gap which would significantly reduce this phenomenon. Analysis of the ETS was conducted without adding a factor for reflectance which in effect then produces a lower possible yield point pressure for damage. This provides a very conservative damage estimation tool for analyzing the expected damage potential of any air coupled explosive device, thereby insuring that the results produced will not result in higher allowable pressures for anticipating damage in reinforced concrete structures. Because the explosive device was located on the ETS face center line, the determinate factor in assessing damage from the blast is a symmetrical pattern of damage on both the left and right halves of the face. Damage not manifested in a symmetrical pattern is classified as peripheral and is caused by the local stiffness of the reinforced concrete panel as an indirect product of the blast wave. 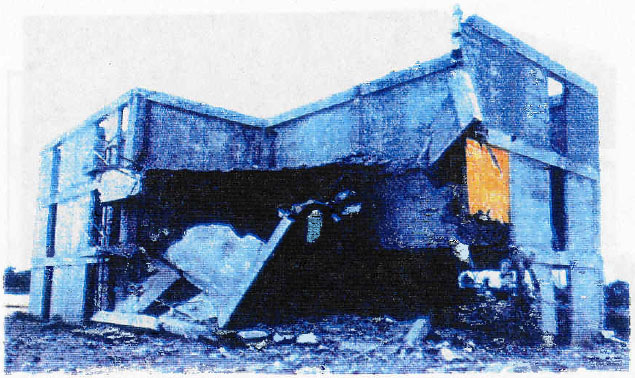 In viewing the post test photo of the ETS from the first test it is important to note the lack of damage caused by shrapnel from the explosion. This is consistent with lightly cased explosive devices and in particular with air coupled blast damage. The reinforcing steel can still be seen in place on the photograph showing in particular the failure mode of the concrete panel. In the case of the air coupled blast wave, the concrete simply breaks up as its' elastic limit is reached leaving the steel reinforcement in place. This is important to note because the yield strength of the steel is approximately 20 times higher than that of the concrete which surrounds it. As the concrete breaks up the steel remains unaffected other than some deflection as the concrete moves. The force required to deflect or bend the #4 rebar is quite low and can easily be duplicated by hand efforts by the typical adult. The other item of importance to note is that the 14 inch columns and beams remain unaffected either by the blast pressure wave or by stresses produced by the reinforcing steel as the six inch concrete panels breakup. As the concrete panels break up some pulling force or tension is generated upon the length of the reinforcing bars and is absorbed by the columns and beams to which they are anchored. The vertical face of the ETS in test one experienced a range of maximum blast pressure from 34 psi to 174 psi. Maximum blast pressure on the first floor wall panel of which the six inch panel was completely destroyed ranged from 74 psi to the maximum experienced of 174 psi. The second floor which experienced serious damage to the wall panels had a range of maximum blast pressures of 53 psi to 141 psi. Three third floor which experienced no damage had maximum blast pressures of 34 psi to 84 psi. In examining the resultant pressures and the damage caused by the test, a general selection has been made of 70 psi as being the yield factor for six inch concrete panel of 3,000 psi strength and light steel reinforcement. While the third floor panels experienced blast pressures in excess of 70 psi to the maximum of 84 areas, it is generally felt that the area experiencing 70 psi to the maximum of 84 psi is small and has been generally discounted in arriving at the 70 psi figure. This figure will be used to identify the probable damage zones from a blast pressure wave resulting from the detonation of 4,800 lbs. of Ammonium Nitrate - Fuel Oil (ANFO) as it relates to six inch concrete panel which is the primary component of the Murrah Federal Building floors. It should be noted that this pressure value is relevant for blast pressure waves striking panels from other than right angles do so with reduced effectiveness, as the angle increases the effectiveness is reduced. A blast pressure wave striking a target at 45 degrees has only 70% effectiveness i.e. : the target while struck with 100 psi would only reasonably absorb or experience approximately 70 psi. of blast pressure. The blast pressure overlay while not directly taking into account these angles, is relevant to the Murrah explosion because the truck placement roughly correlates to the placement of the device in the ETS test when comparing relative placement of structure and configuration of that structure. Because of a variety of factors inherent to explosions, it is impossible to exactly duplicate some effects down to the tiniest detail, however by choosing the weaker structure (ETS) as our basis for estimating potential damage from blast effect, an essentially accurate estimate of anticipated damage can be formulated from these results. The bombing of the Murrah Federal Building and the resulting collapse of so much of the building has raised many questions as to the efficacy of the truck bomb. Utilizing the data from the Eglin Test Series it is possible to produce an expected radius from the center of the device in which damage to six inch panels would be expected. The floor panels in Murrah are of the same thickness and starting with the third floor have a similar positional relationship with the explosive device. The second floor panels terminate some ten feet inside the north line of the building and are placed so as to be roughly perpendicular with the blast wave direction of travel. The columns and beams of the Murrah building are anticipated to behave in roughly the same manner as their counterparts on the ETS. While some maximum blast pressures will be higher than those experienced on the ETS the Murrah columns and beams are much larger, constructed of higher strength concrete, have many times more steel reinforcement and are ballasted by the weight of the building, factors not present in the ETS, which had no damage to the columns and beams after the fire test. The floor panels are far more susceptible to blast pressure damage due to their large surface area and small cross section, the wall panels of the ETS demonstrated this phenomenon in the first test as well as in the second and third. The floor panels in the Murrah Federal Building as outlined earlier had approximately five times as much steel reinforcement for a given cross section as the ETS. The larger contrast however is in the columns and beams where the steel fill in the Murrah Building was much higher than the ETS in most cases by a factor of 10 or more. In addition while the ETS did not use stirrups in its' columns and beams the Murrah Federal Building did, thereby increasing strength to a level far above the ETS. 70 is the blast pressure expressed in pounds per square inch (psi) at the point we are seeking the radius distance for. It can therefore be expected that within a radius of 42.37 feet from the center of the explosive, any six inch reinforced concrete panel positioned so as to have a major face perpendicular or nearly perpendicular to the travel path of the blast pressure wave from the explosion would be damaged. This damage would be in general be confined to the six inch panel itself and based upon the findings in the ETS first test, that damage would be found in the center of the panel as defined by framing of larger structural members and then would be expected to radiate outward. A limited area of the third and fourth floors of the Murrah Federal Building immediately adjacent to the position of the Ryder truck would be affected. On the third floor a roughly circular shape extending 25 feet into the building and approximately 40 feet down the north face of the building from a center point of the explosive which was located some 14.5 feet north of the north face of the building. This circular area contained approximately 1,250 square feet of six inch panel, it should be noted that the northern edge of the third floor terminated with a transfer beam of some three foot in width and five feet in depth. This beam carried the load from the remaining six floors and the roof which was transferred to it by a column placed in the middle of its' 40 foot span. The transfer beam itself weighed 60,000 lbs. and was found essentially intact and undamaged by the effects of the blast pressure wave. The fourth floor panel that experienced 70 psi and above was limited to a roughly circular shaped pattern of approximately 400 square feet. In the case of both the third and fourth floor some failure of the six inch panel would be expected to be found in the center of each panel's 16 foot span and emanating outward. In general a central rupture with loss of concrete would be expected based upon the post test appearance of the ETS. Because the floor panels were supported by T-beams running north-south every 20 feet and these T-beams were of 22 inches depth and 48 inches width the floor panels were only 16 feet in width between the beams. Due to the sizing and mass of the T-beams they should remain unaffected as in the case of the 14 inch beams on the ETS. The six inch panels on the Murrah building should be expected to have additional resistance when compared to the ETS because they are in the horizontal plane and have the effect of gravity which provides some measure of dampening whereas the ETS panels were in the vertical plane without the effect of gravity. In addition no floor damage to the second or third floors of the ETS in the first test can be seen in the photograph or was noted in the memorandum from Wright Laboratory. This fact suggests that more than the 70 psi threshold is required to damage floor panels in events similar to the Murrah bombing or the ETS first test. No peripheral damage would be expected from transfer of loads imposed by the explosion on the panels to the structure because as demonstrated on the ETS concrete separates from the steel reinforcement before sufficient tension can be supplied to the rebar to overload the support members. In the case of the Murrah building although the rebar is slightly larger 5/8" versus 1/2" in diameter and spaced 9" on center as opposed to 18" on center the panel would be expected to rupture in the center long before sufficient loads can be imposed on the structural members that would even approach exceeding structural limits. 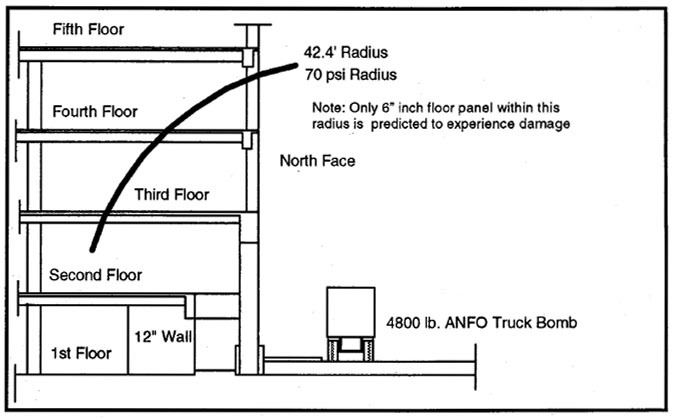 Figure 8 - Floor plan showing maximum predicted damage to third floor and the actual line of damage experienced on April 19, 1995. While the truck bomb at the Murrah Building, and the test device at the ETS were not identical devices with identical conditions, the two events have similarities that are significant enough for comparison. Further with the ETS having less integral strength than the Murrah Federal Building conclusions drawn directly from the ETS have a built in margin of error thereby eliminating the likelihood of drawing erroneous conclusions with respect to the minimal effects anticipated from an explosive blast. It should also be noted that the test device at Eglin had the benefit of highly trained individuals constructing it. Furthermore the explosive material was small enough to be assembled in a single dense package and was of a high energy compound thereby assuring peak performance. The Murrah device was composed of individual drums of approximately 600 lbs. maximum capacity. Eight drums would be the minimum required containment for 4,800 lbs. of ANFO. By having the explosive mixture in many containers efficiency is lost because the explosive is not densely packed. With air gaps between the drums they become in effect eight separate explosive devices working in unison. Efficiency would also be reduced if detonation was not obtained simultaneously by all eight barrels. If some of the barrels depended upon others for detonation you have what would in effect be staggered explosions, while for all purposes these would be indistinguishable, this would result in a variety of shock waves leaving the assembly at different times. The air gaps would also result in the barrels attempting to cancel each other out as the individual shock waves meet in the air gap. The net effect would be to produce an initial shock wave pattern that is elliptical in nature and would result in much of the explosive energy taking a focus directly vertical from the assembly. While the pattern would eventually circularize and form a spherical shape much energy and therefore efficiency is lost in this transition. Because ANFO is also a low energy explosive (approximately 30% that of TNT) and due to the inherent inefficiency of eight barrels forming the explosive assembly, it is doubtful that the device produced blast pressures close to the calculated maximum potential blast pressure. This being the case it is doubtful that the radius of damage even approached the 42.37 foot range as calculated herein. Due to these conditions it is impossible to ascribe the damage that occurred on April 19, 1995 to a single truck bomb containing 4,800 lbs. of ANFO. In fact the maximum predicted damage to the floor panels of the Murrah Federal building is equal to approximately 1% of the total floor area of the building. 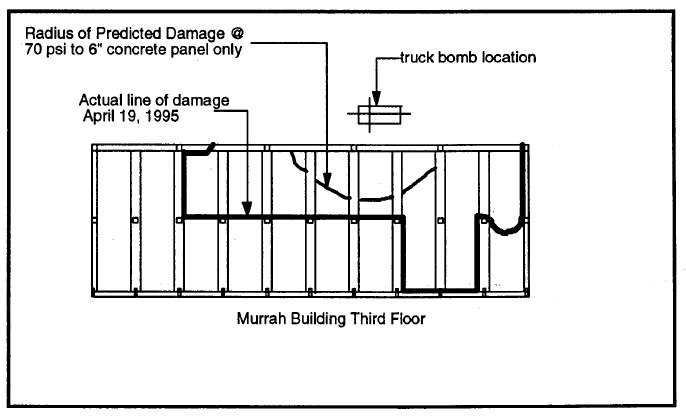 Furthermore due to the lack of symmetrical damage pattern at the Murrah Building it would be inconsistent with the results of the ETS test one to state that all of the damage to the Murrah Building is the result of the truck bomb. The damage to the Murrah Federal Building is consistent with damage resulting from mechanically coupled devices placed locally within the structure as there are certain similarities with the resultant damage to the Murrah Building and with tests two and three. It must be concluded that the damage at the Murrah Federal Building is not the result of the truck bomb itself, but rather due to other factors such as locally placed charges within the building itself. As can be seen from the tests conducted at Eglin Air Force Base under known conditions producing damage to reinforced concrete structures is difficult. Reinforced Concrete exhibits damage resistance that is far above other types of construction including precast concrete masonry. The procedures used to cause the damage to the Murrah Building are therefore more involved and complex than simply parking a truck and leaving. Additional study beyond the scope of this case study will be required in order to properly interpret the damage, describe the actual chain of events and fix the cause of the damage which occurred there on April 19, 1995. Congratulations Rep, there are a lot of interested people looking for this. Pretty much says it all. The truck bomb was insufficient to cause the damage seen in the columns furthest away from the blast. the only conclusion that can be reached is that there was 1 or more additional devices planted in the building at those key areas. This gels with the eyewitness testimony of at least a second explosion, and also with the numerous unfiltered news reports of the bomb squad removing unexploded ordinance, defusing it ( as if the BATF has live dummy bombs lying around for training in a Federal building with hundreds of people in it.) It also confirms the actions of the police and fire withdrawals after finding additional devices. While this is not an exoneration of McVeigh and Nichols, it seems highly unlikely that they would have had access to the Murrah Federal Building in order to wire it up, or place the charges. rebel patriot on Wed, 04/23/2008 - 7:37pm. Man accidentally filmed McVeigh in uniform in an armored vehicle on a military base during the time the the gov reported that they had lost contact with him. AJFan on Wed, 04/23/2008 - 8:20pm. medicis on Wed, 04/23/2008 - 8:43pm. The above video was recorded by Bill Bean on August 3, 1993 at Camp Grafton, North Dakota. For more on that, see "New Oklahoma City Bombing Evidence: Was There a Governmnent Coverup?," Mark Johnson and Bryan Sacks, Hustler, February 2007 (published December 15, 2006), pp. 36-41. James Redford on Thu, 04/24/2008 - 8:48pm. BoDeeDoe on Thu, 04/24/2008 - 6:07am. John_Parulis on Thu, 04/24/2008 - 7:39am. "Many critics of the official explanation point to a blast effects study published in 1997, utilizing test results from the Eglin Air Force Base, which concluded that 'it is impossible to ascribe the damage that occurred on April, 1995 to a single truck bomb containing 4,800 lbs. of ANFO' so that the damage to the Murrah building was 'not the result of the truck bomb itself, but rather due to other factors such as locally placed charges within the building itself". " Some of the editors had deleted all the references to the study, saying there's no proof it even exists. Would it be permissible to put the study in its entirety on the net, or would that be violating some intellectual property or other rights? Vesa on Thu, 04/24/2008 - 9:24am. 'If I'm not mistaken, they recreated the truck to nearly exact specifications as well as the bomb. They arranged the bomb in the same manner that Tim described. They then detonated it. The results they were trying to obtain were to disprove the pressures that Partin cites. The problem was they also showed several clips of the cement column they reproduced. Guess what? The column was NOT destroyed, barley moved in place, and was only peppered with fragments. They used the excuse that the blast disrupted their equipment and so they didn't get an original PSI reading. So like good scientists, they perform the experiment again. They blame the problems with the first test on Tim's description of how "he" arranged the Anfo in the truck itself. On the second attempt, they use an open flat bed truck, rearrange the Anfo into a different configuratioin (Tim was lying about his) and detonated the bomb. Well this time they got the desired PSI rating to prove Partin wrong. The single cement reinforced column again barely moved in its place, was again peppered with debris, but most importantly was not shattered at all. The editors were very careful in trying to hide this fact. They only briefly showed the column again interspaced with other clips. Hell, I would too if I had just proven a conspiracy theory correct. The whole point of the show was to discredit Partin, when in reality it proved that the truck bomb on two different occasions did not destroy a column. The blast slightly moved the colmun in place. The column was only peppered with debris. You could only see the rebar in one patchy area. Yet the official story states that this same configuration and the same anfo bomb was responsible for completely shattering multiple columns on the exterior of the building as well as deep into the structure!! Now is it any suprise the same federally funded scientists who worked the OKC bombing just happen to work the WTC attacks??? Swingdangler on Thu, 04/24/2008 - 9:31am. kids. Must make some people feel like heroes to pull such a stunt. Doesn't say much for US institutions to tolerate such fascist garbage. It's funny how authoritarianism is considered patriotic...ie...it is considered patriotic (in establishment circles) to shut your mouth and cheerlead as government officials lie to the public and pass all sorts of BS anti-terrorism legislation. noise on Thu, 04/24/2008 - 10:54am. As with WTC93, the administration did have an undercover informant in the alleged perpertrators group. Her name was Carol Howe and she reported all she knew to the higher ups. Some of her reports one can examine that there were connections to intelligenca agencies, as she spoke of several foreign white guys, who were dated ba McVeigh and Nichols. The yellow Ryder Van was photografed several weeks before the bombing, in a highly secret military camp. The photographer dies shortly afterthat in an accident. The blast could not been by one ANFO-bomb outside the building, as the explosive blast direction will seek the way with least resistance first- so the free area. Additional charges were found and reported, but later dismissed as conspiracy theories. McVeigh was filmed on a tank in a top secret military camp after his official end of his military career. Sitting-Bull on Thu, 04/24/2008 - 11:13am. Carol Howe was on the inside and then had to defend herself and change her name later, Andy the German Strassmier was also on the inside and no doubt worked for the CIA, google elohim city and howe and strassmeir. Janet Reno and Bill Clinton said they would leave no stone left unturned! Liars! The ATF budget went right thru the roof after this one. Bill Clinton - how dare you! peacefulwarrior on Thu, 04/24/2008 - 2:49pm.